You will forget about the classic recipe when you try these pancakes. 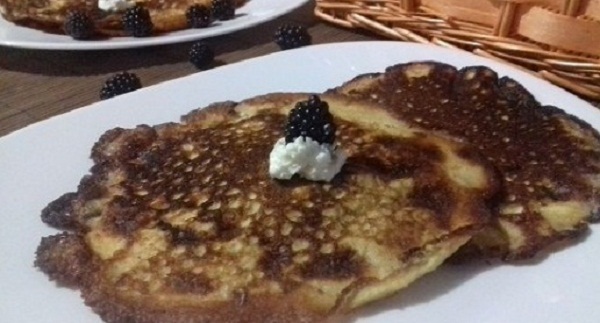 Low Carb Pancakes with only 2 ingredients and without flour and sugar. Sounds amazing! You have no idea what to eat, not to burden the body with pastry? Or do you want a speedy treat, for which you do not need a lot of money? This recipe is the ideal for you – pancakes of just two ingredients, which you almost always have in the refrigerator. Thin, soft and delicious! But they are also and healthy. How? They are gluten-free, sugar-free, without starch and grain. You will get about 8 large pancakes. Mix eggs and cream cheese in the blender. If you do not have a blender, then mix with a mixer. Make sure to mix well until the mixture becomes completely smooth. Let the mixture stand for one or two minutes. Pour a little mixture into the pan (about 2 tablespoons or half a ladle). It is easily poured and “broader”. Bake (fry)them until they get brown. You can make them in two options – sweet and salty. It depends on the type of oil and cream cheese.